For those wanting to follow in the footsteps of explorers Amundsen and Scott, this is a great map to check out. On one side of the map the entire continent of Anarctica is shown surrounded by pictures and interesting facts of the men and women who have braved this beautiful yet harsh place. 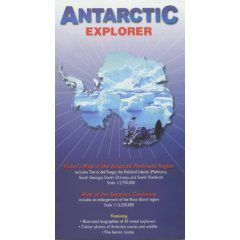 The reverse side shows the tip of the antarctic peninsula in greater detail including insets of Anvers Island and South Georgia.